I have a whole lot of thanks to offer for the journey these masks have taken me on over the years. The many wise and brilliantly talented people whose dances and stories have become threads woven into my own life stories in the course of my travels with the masks. I think, even though the collection is going, that the work isn't entirely over. I've long been disatisfied with the book I've been trying to write about the project. I've actually had several rounds of submissions to publishers and agents, visualizing a coffee table/art book, a treatise on mythologies of the Goddess, and essays I've written about the importance of the Goddess as collective and personal archetypes. None of it worked out. I've come to the conclusion that what I want to document is a very personal process, a "patchwork quilt" of stories, images, and quotes, my own, and many that I've gathered from others along the trail. Because the trail has truly been a CHAUTAQUA - not my own, but a Chautaqua, a gift of tremendous generosity, carried down the road by many. My privilege is that I was able to provide some measure of my own gifts to the process. My notes on Hecate (here), and Spiderwoman (also on this blog) touch a kind of personal quality I want. Fact is, its enormously difficult to publish a book commerically these days anyway, so if I'm going to document this long project in a way that satisfies my soul, I might as well do it exactly the way I want to, because I'll probably end up publishing a limited edition of the book myself anyway. Good inquiry often starts with a question. So what are the "masks" of the Goddess? I don't mean the collection on my website, rather, the metaphorical and spiritual and psychological "masks". How do they exist within each of us, how do we wear them, consciously, and unconsciously? Are there new ones, nameless ones, ancient ones, future ones? What happens when a woman, or a group, "invokes" an archetype of a goddess? 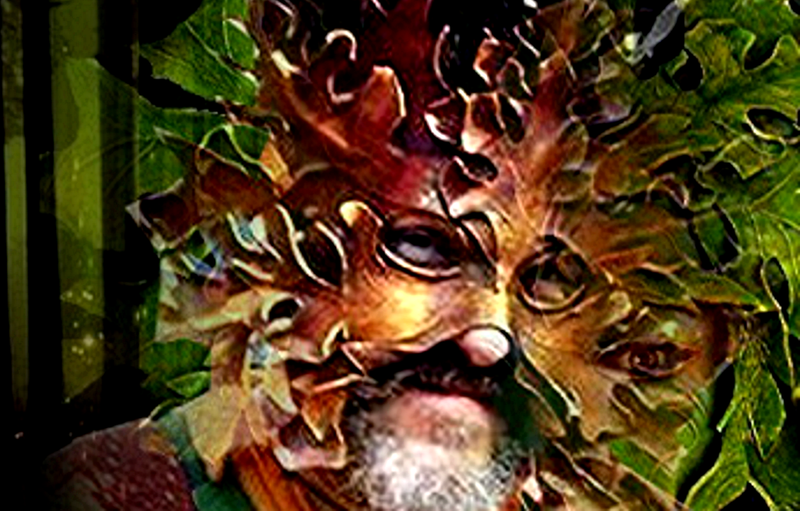 When one "wears" a mask, metaphorically or literally, I've often found that so much story, energy, collective mythos comes forward, inhabits us, co-creates with us, "anima - ates". To engage the Goddess in any form is to open a Conversation, a mysterious process of syncronicities, empowerments, insights, and plenty of "shadow work" as well. Just yesterday I was thinking about Sophia. On the path before me, while walking, I saw a white dove (probably an albino mourning dove).............. a rare sight. Doves are the sigel of Sophia, Goddess of wisdom. 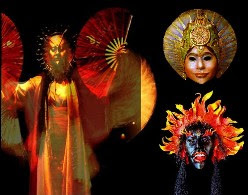 Since 1999, my "Masks of the Goddess" have traveled across the U.S. for exhibits, rituals, and community performances. 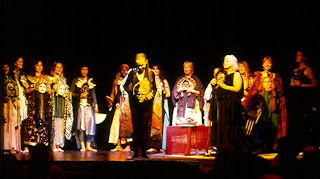 The Goddesses have appeared in theatres in Sebastopol and Tucson, in the woods at the Starwood Festival, at the Chapel of the Sacred Mirrors in New York City, at Syracuse University's "Matrilineage Festival" and the Mask Symposium at the University of Southern Illinois, and many others. 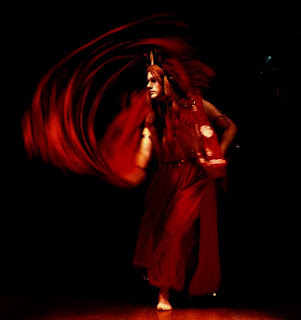 In 2006 it was my privilege to see the full collection reunited at the 27th Annual Spiral Dance at Kezar Pavilion in San Francisco. The auction begins November 27, and lasts until January 27. To learn more, or bid on a mask in the collection, enter my gallery at http://www.rainewalker.com/ and visit the Auction page. Thank you for your support over the years - I'm so grateful for all we've shared. Metaquiesin. I have failed, in the course of pursuing my threads and poetics about November, to add that November is also the month of Thanksgiving, at least, in the United States it is. The end of November. And that makes sense to me ~ how can we talk about the closing of the year, going "into the dark", and honoring our ancestral strands ~ without, finally, arriving at GRATITUDE? For all that has been and been given, the gift of life not the least, the tapestry we each are woven into, and weavers as well? Perhaps Gratitude is the soil, the enzyme, the only appropriate medium to plant any seed in. I offer now bread, red fruit, red wine. To life. Come to the table, all. A dappled pear, an apple, a pomegranate. deep in the depths of this dream. The weathervanes will turn again. The wheat has new life in it yet. The blessing will still be given. "They move too fast to see more than the surface glitter of a life too swift to be real. They are assailed by too many new things ever to find the depths in the old before it has gone by. The rush of life past them they call "progress", though it is too rapid for them to move with it. Man remains the same, baffled and astonished, with a heap of new things around him but gone before he knows them. Men may live many sorts of lives, and this they call "opportunity", and believe opportunity good without ever examining any one of those lives to know if it is good. " The above quote lit up the page I was reading, and I felt moved enough to forsake my electric blanket, and come to the computer to copy it on my blog. It's 4:00, I'm reading the book DANCING AT THE EDGE OF THE WORLD - Thoughts on Words, Women and Places, by Ursula Kroeber Leguin. I have a cold or virus, and a recent conversation with my friend Barbara of San Francisco, about the dark, and menopause, and the crone Goddess Hecate, Guide through the Underworld, lie in bed with me, not entirely comfortable companions. Now what does this comment have to do with Hecate, and my personal journey through the month of November, the month of endings, celebration of the dead, composting of the year, leaves, souls? What does this have to do with the saturnine retreat from just about everything, including my own creative process, that I've been going through ever since I returned to Tucson? Well, a lot. I see a long and winding spiral developing here, and I'm going to follow it down and around, imagining in my mind the thoughts, threads and connections similar to brown leaves, blowing across a dark November pavement, forming some winter crysalis, a pattern not yet under the snow, but soon, very soon it will be. Not to be revealed or read until the snow (which has not yet fallen) thaws in life's spring resurgence. I love the quote above, from a popular 1940's Utopian novel, because its character, Lord Dorn, says it so well. Personally, I can't keep up anymore. I find myself retreating from the continual "stimulation" , hiding out, needing to get as far away sometimes into the wilderness as I can. What I feel a loss of is "depth experience". As our world accelerates, we find it harder and harder, I believe, to touch things. To touch the depths of the stories of our lives, to touch each other, to relish and taste what we have within the onslaught of "more, and more" - to touch the earth and the layers of lives that preceeded us, although we carry them within. I think the pace of our lives has taken away the time needed, the cyclical time reflected in all organic systems...........to "compost". To rot, fall apart, re-turn into the dark, re-form, be re-formed by the organic, collective forces we are woven into in the cycles of the planet, and our souls. "In Western traditions" author Jay Weidner writes, "there was once a vast pilgrimage that took place in Europe. Pilgrims made their way towards the town of Compostella in Spain, where an ancient effigy of the BLACK MADONNA is housed. The word Compostella comes from the same root word as compost. COMPOST is the living, black material that is made from rotting fruits, grains and other organic matter. From this compost -- life and light will emerge. When the pilgrims came to the Cathedral at Compostella they were being 'composted' in a sense. After emergence from the dark confines of the cathedral and the spirit -- they were ready to flower, they were ready to return home with their spirits lightened." Many Roman gardens used to have a special shrine devoted to the morose god, Saturn. A place, it was understood, one went to be alone, to brood, perhaps to grieve. As I get older, and my personal energy reserves are more concentrated and precious, I have come to believe that giving meloncholy its due, discovering what the gifts of depression are, taking time to experience the depths revealed in Saturn's solitary corner of the garden - is essential to nourishing, indeed sustaining, our spirits. Just as Romans understood the need to have a shadow-dappled seat dedicated to Saturn in the gardens of their lives, I think a seat devoted to Hecate, goddess of the underworld, in a contemporary garden, might be similar in design and purpose. So who is Hecate? She's the crone aspect of the triple Earth Mother Demeter/ Persephone/ Hecate. Like Saturn, she is old. An old woman, past menopause, past many life passages, well aquainted with various portals that separate these seeming doors. A Gatekeeper, and a light bearer. She is part of the whole that is the Goddess, and she is within each of us. "In us is also a dark angel (Hekate was also called "angelos") - a consciousness (she was also called "phosphoros") that shines in the dark and witnesses such events because it is already aware of them a priori.........Part of us is not dragged down but always lives there, as Hekate is partly an underworld Goddess." 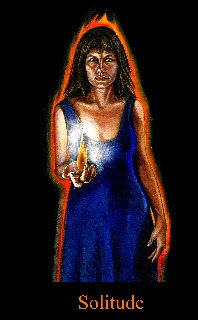 As Barbara pointed out (vehemently enough to demand I write it down, but after all, she did invoke and perform Hecate in 2001.....) - Hecate is the patroness of women (and men) who are no longer producing hormones. What are hormones? Well, from Gaia's point of view, they're very potent drugs that induce us to want to reproduce, and thus carry on the evolutionary experiment, braving the painful and even sometimes lethal consequences of childbearing. When estrogen is gone, as I've heard so many women say, many of life's illusions seem to peel away. Veils that have muffled all kinds of personal illusions, beliefs, and ideals fall away ..........and there you are. Revealed. Clarified. Pissed off that you've wasted so damn much of your precious time and energy on such nonsense, such dramas, such theatre, outraged and shamed that you were so stupid, immature, brainwashed,........human. You begin to see the storylines more deeply, the threads that weave the plot. Just recently, for example, I've painfully re-experienced many moments in my mother's marriage to my father, understood at last how trapped she felt, how he enjoyed humiliating her, and how she felt she had to call enduring his cruelty "love" in order to emotionally survive. I see, of course, that I've carried on some of the same story in my own life, the same blinds. Time to "fall apart" has helped me to find compassion for my mother, and myself. Occasionally, you also notice you are wise in your genuine, candid, and almost perfect Ignorance. Maybe Hecate, in her mask and role as an old woman, standing so close to the final portals of this world, moving freely into the veiled realms - may be said to represent the SOUL aspect of self. "Part of us is not dragged down, but already lives there........." as Dr. Hillman said. Already lives there, the gestalt, the storyteller as well as the story. Looking at the yin/yang symbol I wear on a ring, I remind myself that somehow the various parts of my being are, like the dark teardrop and the white teardrop, in flux and co-creation. This weaving of story is not only enlightenment, it is also "endarkenment", the self that waits, is circular, un-named, yin. That "already lives there." Already lives there, yes. But one does not converse with Hecate, and gain the benefits of Her guidance, without stopping, listening. Perhaps she will not come at all, until we fall apart, can't go any farther, run out of gas, slow the pace, fall off the treadmill. Thus, the necessary time to grieve, to be revealed, to make the pilgrimage to Compostella ..............comes about, and one may then see Her, poised, with her candle, at the doorway. 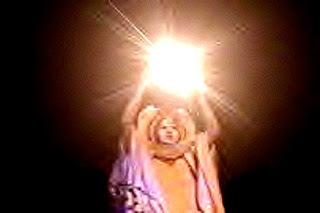 She won't let you get away with anything - she'll illuminate it all, as you begin the journey. She will not make an appearance during commercial breaks, or at any "convenient time". I don't believe you'll find her in a day spa, and I don't even believe she has patience with prozac or anything that blunts the descent. Hecate dwells in the Caverns, she dwells in the Depths. It's been a long time since I've written in this blog. Much has changed since I came back to Tucson, or perhaps it's easier to say that returning, I was immediately cast into any number of internal sea storms that precede change. My environment in Tucson is unchanged. Just me. I'm changing. Returning several things happened: I became depressed. And angry. My life seemed so lonely here, purposeless, my concerns for my mother and troubled brother overwhelming and something I feel powerless to change or even talk about, many of my connections with others now seemed superficial. Feelings of needing to move on, not knowing where to move on to.........and so on. In other words, after my wanderings, I returned to find myself immersed in melancholy and confusion, feeling ashamed for feeling that way. After all, haven't I been talking about interconnectedness, and community, and healing, for all these years? How could I find myself in this Saturnine morass? There are times when, like it or not, various illusions that have sustained a worldview, a personal myth, a relationship, the cocoon of a personality............breakdown, activate, digest, bloom, become......obvious. I found myself unhappy with myself, and just about everything else. That wasn't supposed to happen after my wonderful summer! Meanwhile, butterflies turned up. Fluttering by at appropriate moments in the course of my thoughts, flying over my windshield while waiting in traffic as if to say "follow me". Then a woman from N.Y.C. called, and wanted two custom "Butterfly Women" for a convention. 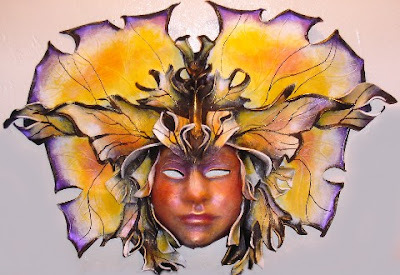 After making those masks (which I'm quite pleased with, they were beautiful), I also received an invitation to join "The Butterfly Connection", an arts organization in Ft. Worth, Texas! Depressed, and recovering from surgery, butterflies flutter metaphorically, creatively, literally, bringing their message of beauty, mystery, CHANGE. I'd like to make a comment here about Butterflies. When the caterpillar is neatly cocooned in its crystallise, it's not necessarily having a great time, or even a nice nap in there. The "Imaginal Cells" (yes, that's what they are actually called) are enzymes and agents of change that basically reduce the poor caterpillar, and all of it's juvenile memories of munching contentedly on glossy summer leaves...............to SOUP. Change is rarely effortless, or comfortable. One of the painful discoveries I made in the course of the past 6 Saturnine weeks is that my Masks of the Goddess project, at least as it has been for the past 8 years, is over. I need to move on, bringing closure to both the project and the past, a place and time I realize I'm stuck in. I no longer have the means to continue to keep the collection circulating, financially or emotionally. Coming to this realization has forced me as well to be honest with myself about many negative feelings that have accumulated like soot over the years as well - feelings of disappointment, anger at others, anger and shame at myself for often being unfair in my expectations of others. I feel lightened now, having done this "8 year life review". And all throughout, butterflies occurred. at the top of this page. Because, well, I've been given such an affirmation! 1997, ten years ago, was a visionary, intense year for me. My marriage was over, my psyche was wide open as I grieved the past and also opened to new life and possibility. That fall, after the papers came through, I left my home on the East Coast, and by early November, was settled into my little trailer on the grounds of the Arizona Renaissance Faire. Since the Faire is out in the desert outside of Apache Junction, and didn't open until February, I had lots of time to go crazy, dream, heal, and grieve, in relative isolation. I didn't have a clue what the next step was, but I did begin to learn about the Internet, and was enjoying my first computer, creating my first website. I had November, 1997 through March of 1998 to figure out what I was going to do next. I began to get on the Web, looking up anything I could think that interested me. Transformative arts, masks, art and consciousness, ritual theatre, women's spirituality...........and every time, without fail, everything came up either San Francisco, Berkeley, or Marin Country, California. Without fail. I lived in Berkeley in it's heyday, and went to U.C. Berkeley. I left in 1976, to move to the East Coast. I hadn't thought of returning to California, but now my interest struck. The clincher was when I searched for "The Center for Symbolic Studies", founded by Stephen Larsen in Rosendale, New York. I wanted to ask his wife, Robin, to write a recommendation for me, as I'd taught a workshop and given a performance there. Up came "The Center for Symbolic Studies", in Berkeley, California. 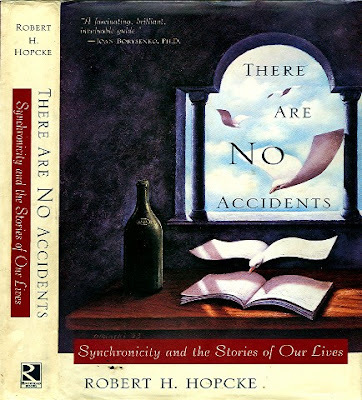 The founder, Robert H. Hopke, had just published a book called: "There Are No Accidents - Synchronicity and the Stories of our Lives". I'm not sure it gets better than that, but perhaps Dr. Hopke has stories to match. Being at the crossroads anyway, that was the clincher. I packed up my van at the end of the season, my cat, and my laptop and headed back to Berkeley after 20 years absence, prepared to sleep in my car if necessary until I found a place. Fortunately for me, my idea of finding a place in Berkeley was based on my memories of 1976. Otherwise, I might have been daunted indeed. On a glorious spring day, I rolled onto Telegraph Avenue, parked my van, and decided to have a cup of coffee at the Med before I began my new life. I walked in, stood in the cappachino line, and ran into an old friend, Joji Yokoi, who remembered me after all those years. Remembered me, bought me a coffee, and offered me a room in his house while I looked for a place. I didn't have to sleep in my car even one night. Two months later I was Judy Foster's roomate, working with Food Not Bombs, and celebrating the summer Solstice with Starhawk and Reclaiming (Judy was one of the founders of Reclaiming). 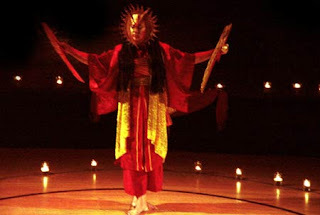 A year after that I had my Rites of Passage Gallery in Berkeley, created the Masks of the Goddess for the Spiral Dance, and was fire dancing with Serene Zloof and her friends. Everything that happened in those years ...... seemed like that. Seamless. And then I returned to Arizona, in 2000. I've often wondered what it might have been like if I'd stayed, kept my gallery, continued the life I was enjoying so much in Berkeley. There was a period when I was desperate to return to California, to return to the life I had, the project that seemed to vital there, and so difficult to generate here - but of course, you can't really do that. You can't go back. Concluding my project, selling the masks, brings up a lot. So I was delighted when I attended, just yesterday, a meeting of the Southern Arizona Friends of Jung. Their subject was the Divine Feminine, and I enjoyed sharing both my masks and knowledge with them. And there on the coffee table was Dr. Hopke's book, which one of the members had brought in randomly. It's not a common book at all, but to me, it was like a talisman. In the warmth of the group and their appreciation for my work I felt - affirmed. The talisman opened, and closed, my ten year journey. A postcard from Spiderwoman. I don't know what to say at such moments, except, Thankyou. GRACE.